The science of complexity is concerned with the study of complex, adaptive systems. Its insights have in recent decades been applied with gusto by social scientists and other thinkers. As research in and around the application of complexity science flourishes as never before, this new five-volume collection from Routledge meets the need for an authoritative reference work to make sense of a rapidly growing-and ever more complex-corpus of literature. Edited by leading scholars, the collection gathers foundational and canonical work, together with innovative and cutting-edge applications and interventions. 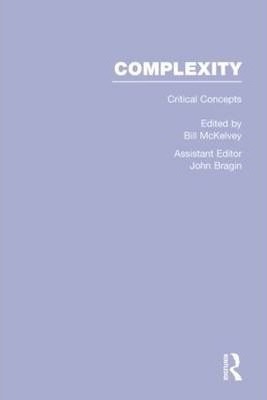 With a full index, together with new introductions to each volume, which place the collected material in its historical and intellectual context, Complexity is an essential work of reference. The collection will be particularly useful as an essential database allowing scattered and often fugitive material to be easily located. It will also be welcomed as a crucial tool permitting rapid access to less familiar-and sometimes overlooked-texts. For researchers, students, practitioners, and policy-makers, it is as a vital one-stop research and pedagogic resource. 1. H. A. Simon, `The Architecture of Complexity', Proceedings of the American Philosophical Society, 1962, 106, 467-82. 2. M. Gell-Mann, `What is Complexity? ', in A. Q. Curzio and M. Fortis (eds. ), Complexity and Industrial Clusters: Dynamics and Models in Theory and Practice (Physica-Verlag, 2002), pp. 13-24. 3. P. Cilliers, `Approaching Complexity', in Complexity and Postmodernism: Understanding Complex Systems (London and New York: Routledge, 1998), pp. 1-24. 4. G. Nicolis and I. Prigogine, `Complexity in Nature', in Exploring Complexity: An Introduction (1977/1989), pp. 5-44. 5. P. Allen, `Evolution, Modelling, and Design in a Complex World', Environment and Planning B, 1982, 9, 1, 95-111. 6. R. Swenson, `Emergent Attractors and the Law of Maximum Entropy Production: Foundations to a Theory of General Evolution', Systems Research, 1989, 6, 3, 187-97. 7. L. D. Kiel, `Lessons from the Nonlinear Paradigm: Applications of the Theory of Dissipative Structures in Social Sciences', Social Science Quarterly, 1991, 72, 3, 431-42. 8. B. J. Zimmerman and D. K. Hurst, `Breaking the Boundaries: The Fractal Organization', Journal of Management Inquiry, 1993, 2, 4, 334-55. 9. A. Juarrero, `Nonequilibrium Thermodynamics', Dynamics in Action: Intentional Behavior as a Complex System (1999), pp. 119-30. 10. W. R. Ashby, `Principles of the Self-Organizing System', in H. von Foerster and G. W. Zopf (eds. ), Principles of Self-Organization (Pergamon, 1962), pp. 255-78. 11. J. S. Wicken, `Evolutionary Self-organization and Entropic Dissipation in Biological and Socioeconomic Systems', Journal of Social and Biological Structures, 1986, 9, 261-73. 12. J. A. S. Kelso, `The Complementary Nature of Coordination Dynamics: Self-Organization and Agency', Nonlinear Phenomena in Complex Systems, 2002, 5, 4, 364-71. 13. D. Chu, R. Strand, and R. Fjelland, `Theories of Complexity: Common Denominators of Complex Systems', Complexity, 2003, 8, 3, 19-30. 14. J. H. Holland, `The Global Economy as an Adaptive System', in P. W. Anderson, K. J. Arrow, and D. Pines (eds. ), The Economy as an Evolving Complex System, Proceedings of the Santa Fe Institute, Vol. V (Addison-Wesley, 1988), pp. 117-24. 15. W. B. Arthur, `Positive Feedback in the Economy', Increasing Returns and Path Dependence in the Economy (University of Michigan Press, 1990), pp. 1-12. 16. P. Ormerod, `Attractor Points', Death of Economics (John Wiley & Sons, 1994), pp. 138-61. 17. J. B. Rosser, Jr., `On the Complexities of Complex Economic Dynamics', Journal of Economic Perspectives, 1999, 13, 4, 169-92. 18. J. Foster, `Competitive Selection, Self-Organization and Joseph A. Schumpeter', Journal of Evolutionary Economics, 2000, 10, 311-28. 19. W. A. Brock and S. N. Durlauf, `Social Interactions and Macroeconomics', in D. Colander (ed. ), Post Walrasian Macroeconomics (Cambridge University Press, 2006), pp. 97-115. 20. W. Buckley, `Society as a Complex Adaptive System', Modern Systems Research for the Behavioral Scientist (Aldine, 1968), pp. 490-513. 21. R. L. Carneiro, `The Evolution of Complexity in Human Societies and its Mathematical Expression', International Journal of Comparative Sociology, 1987, 28, 111-28. 22. M. Reed and D. Harvey, `The New Science and the Old: Complexity and Realism in the Social Sciences', Journal for the Theory of Social Behavior, 1992, 22, 4, 353-80. 23. K. M. Mathews, M. C. White and R. G. Long, `Why Study the Complexity Sciences in the Social Sciences? ', Human Relations, 1999, 52, 4, 439-62. 24. C. Smith and G. Gemmill, `Change in the Small Group: A Dissipative Structure Perspective', Human Relations, 44, 7, 1991, 697-716. 25. M. J. Wheatley and M. Kellner-Rogers, `Self-Organization: The Irresistible Future of Organizing', Strategy & Leadership, 1996, 24, 4, 18-24. 26. P. P. Saviotti and G. S. Mani, `Technological Evolution, Self-organization, and Knowledge', Journal of High Technology Management Research, 1998, 9, 2, 255-70. 27. F. Heylighen, `Complexity and Self-organization', in M. J. Bates and M. N. Maack (eds. ), Encyclopedia of Library and Information Sciences (Taylor & Francis, 2008), pp. 1215-24. 28. R. MacIntosh and D. MacLean, `Conditioned Emergence: A Dissipative Structures Approach to Transformation', Strategic Management Journal, 1999, 20, 4, 297-316. 29. J. Goldstein, `Emergence: A Construct Amid a Thicket of Conceptual Snares', Emergence, 2000, 2, 1, 5-22. 30. P. Bak and K. Chen, `Self-Organized Criticality', Scientific American, 1991, 264, 46-53. 31. J. Scheinkman and M. Woodford, `Self-Organized Criticality and Economic Fluctuations', American Economic Review, 1994, 84, 2, 417-21. 32. G. G. Brunk, `Why Are So Many Important Events Unpredictable? Self-Organized Criticality as the "Engine of History"', Japanese Journal of Political Science, 2002, 3, 1, 25-44. 33. R. Frigg, `Self-Organised Criticality: What it is and What it isn't', Studies in History and Philosophy of Science, 2003, 34, 613-32. 34. R. Kron and T. Grund, `Society as a Self-Organized Critical System', Cybernetics and Human Knowing, 2010, 16, 1-2, 65-82. 35. R. D. Stacey, `Strategy as Order Emerging from Chaos', Long Range Planning, 1993, 26, 1, 10-17. 36. R. A. Thietart and B. Forgues, `Chaos Theory and Organization', Organization Science, 1995, 6, 1, 19-31. 37. W. Frederick, `Creatures, Corporations, Communities, Chaos and Complexity: A Naturological View of the Corporate Social Role', Business and Society, 1998, 37, 358-89. 38. J. A. C. Baum and B. S. Silverman, `Complexity in the Dynamics of Organizational Founding and Failure', in M. R. Lissack and H. P. Gunz (eds. ), Managing Complexity in Organizations (Quorum Books, 1999), pp. 292-312. 39. R. T. Pascale, `Surfing the Edge of Chaos', Sloan Management Review, 1999, 40, 3, 83-94. 40. E. Rullani, `The Industrial Cluster as a Complex Adaptive System', in A. Q. Curzio and M. Fortis (eds. ), Complexity and Industrial Clusters (Physica-Verlag, 2002), pp. 35-61. 41. R. G. Little, `Toward More Robust Infrastructure: Observations on Improving the Resilience and Reliability of Critical Systems', Proceedings of the 36th Hawaii International Conference on System Sciences, IEEE Computer Society (2003), pp. 58-67. 42. M. P. Feldman and J. Francis, `The Entrepreneurial Spark: Individual Agents and the Formation of Innovative Clusters', in A. Q. Curzio and M. Fortis (eds. ), Complexity and Industrial Clusters (Physica-Verlag, 2002), pp. 195-212. 43. D. A. Plowman, L. T. Baker, T. E. Beck, M. Kulkarni, S. T. Solansky, and D. V. Travis, `Radical Change Accidentally: The Emergence and Amplification of Small Change', Academy of Management Journal, 2007, 50, 3, 515-43. 44. M. C. White, D. B. Marin, D. V. Brazeal, and W. H. Friedman, `The Evolution of Organizations: Suggestions from Complexity Theory about the Interplay between Natural Selection and Adaptation', Human Relations, 1997, 50, 11, 1383-401. 45. P. Anderson, `Complexity Theory and Organization Science', Organization Science, 1999, 10, 3, 216-32. 46. K. J. Dooley and A. H. Van de Ven, `Explaining Complex Organizational Dynamics', Organization Science, 1999, 10, 3, 358-72. 47. P. Cilliers, `Boundaries, Hierarchies and Networks in Complex Systems', International Journal of Innovation Management, 2000, 5, 2, 135-47. 48. E. Mitleton-Kelly, `Ten Principles of Complexity and Enabling Infrastructures', in E. Mitleton-Kelly (ed. ), Complex Systems and Evolutionary Perspectives on Organisations (Elsevier, 2003), pp. 23-50. 49. R. Kupers, `What Organizational Leaders Should Know about the New Science of Complexity', Complexity, 2001, 6, 1, 14-19. 50. G. Surie and J. Hazy, `Generative Leadership: Nurturing Innovation in Complex Systems', Emergence: Complexity and Organization, 2006, 8, 4, 13-26. 51. M. Schneider and M. Somers, `Organizations as Complex Adaptive Systems: Implications of Complexity Theory for Leadership Research', The Leadership Quarterly, 2006, 17, 4, 351-65. 52. D. A. Plowman, S. Solansky, T. E. Beck, L. Baker, M. Kulkarni, and D. V. Travis, `The Role of Leadership in Emergent, Self-Organization', The Leadership Quarterly, 2007, 18, 341-56. 53. M. Uhl-Bien, R. Marion, and B. McKelvey, `Complex Leadership: Shifting Leadership from the Industrial Age to the Knowledge Era', The Leadership Quarterly, 2007, 298-318. 54. D. Schwandt, `Individual and Collective Coevolution: Leadership as Emergent Structuring', in M Uhl-Bien and R. Marion (eds. ), Complexity and Leadership: Part I: Conceptual Foundations (Information Age Publishing, 2008), pp. 101-27. 55. B. McKelvey, `Complexity Leadership: The Secret of Jack Welch's Success', International Journal of Complexity in Leadership and Management, 2010, 1, 1, 4-36. 56. D. Levy, `Chaos Theory and Strategy: Theory, Application and Managerial Implications', Strategic Management Journal, 1994, 15, 167-78. 57. K. J. Dooley, T. L. Johnson, and D. H. Bush, `TQM, Chaos and Complexity', Human Systems Management, 1995, 14, 4, 287-303. 58. R. Pascale, M. Millemann, and L. Gioja, `Self-Organization and Emergence', Surfing the Edge of Chaos: Laws of Nature & the New Laws of Business (Random House, 2000), pp. 113-27. 59. M. C. Moldoveanu and R. M. Bauer, `On the Relationship Between Organizational Complexity and Organizational Structuration', Organization Science, 2004, 15, 1, 98-118. 60. C. Wycisk, B. McKelvey, and M. Hulsmann, `"Smart Parts" Supply Networks as Complex Adaptive Systems: Analysis and Implications', International Journal of Physical Distribution and Logistics Management, 2008, 38, 2, 102-25. 61. H. Van Dyke Parunak, R. Savit, and R. L. Riolo, `Agent-Based Modeling vs. Equation-Based Modeling: A Case Study and Users' Guide', Proceedings of Multi-Agent Systems and Agent-Based Simulation (MABS '98) (Springer, 1998), pp. 10-25. 62. M. Morrison, `Models as Autonomous Agents', in M. S. Morgan and M. Morrison (eds. ), Models as Mediators (Cambridge University Press, 1999), pp. 38-65. 63. R. Axtell, `Why Agents? On the Varied Motivations for Agent Computing in the Social Sciences', Center on Social and Economic Dynamics Working Paper No. 17 (2000). 64. L. Henrickson and B. McKelvey, `Foundations of "New" Social Science: Institutional Legitimacy from Philosophy, Complexity Science, Postmodernism, and Agent Based Modeling', PNAS, 2002, 99, 3, 7288-95. 65. M. W. Macy and R. Willer, `From Factors to Actors: Computational Sociology and Agent-Based Modeling', Annual Review of Sociology, 2002, 28, 143-66. 66. L. Tesfatsion, `Agent-Based Computational Economics: Growing Economies from the Bottom Up', ISU Working Paper No. 1 (presented at the National Academy Science Colloquium, 2002). 67. J. M. Epstein, `Remarks on the Foundations of Agent-based Generative Social Science', in L. Tesfatsion and K. L. Judd (eds. ), Handbook of Computational Economics, Vol. 2. (Elsevier, 2006), pp. 1585-604. 68. J. M. Epstein, `Why Model? ", Journal of Artificial Societies and Social Simulation, 2008, 11, 4. 69. N. Gilbert and P. Terna, `How to Build and Use Agent-Based Models in Social Science', Mind & Society, 2000, 1, 57-72. 70. K. M. Carley, `Simulating Society: The Tension between Transparency and Veridicality', Proceedings of Agents 2002, Chicago IL. 71. S. Bankes and R. Lempert, `Robust Reasoning with Agent-Based Modeling', Nonlinear Dynamics, Psychology, and Life Sciences, 2004, 8, 2, 65-84. 72. G. Kuppers and J. Lenhard, `Validation of Simulation: Patterns in the Social and Natural Sciences', Journal of Artificial Societies and Social Simulation, 2005, 8, 4. 73. M. W. Macy and J. Skvoretz, `The Evolution of Trust and Cooperation between Strangers: A Computational Model', American Sociological Review, 1998, 63, 638-60. 74. N. Contractor, R. Whitbred, F. Fonti, A. Hyatt, B. O'Keefe, and P. Jones, `Structuration Theory and Self-Organizing Networks' (Working Paper, 2000). 75. B. LeBaron, `Empirical Regularities from Interacting Long- and Short-Memory Investors in an Agent-Based Stock Market', IEEE Transactions on Evolutionary Computation, 2001, 5, 5, 442-55. 76. R. Sun and I. Navah, `Simulating Organization Decision-making Using a Cognitively Realistic Agent Model', Journal of Artificial Societies and Social Simulation, 2004, 7, 3. 77. D. G. Brown and D. T. Robinson, `Effects of Heterogeneity in Residential Preferences on an Agent-Based Model of Urban Sprawl', Ecology and Society, 2006. 78. L. A. Adamic, `Zipf, Power-Laws, and Pareto: A Ranking Tutorial' (Information Dynamics Lab, Palo Alto, CA, 2009). 79. M. E. J. Newman, `Power Laws, Pareto Distributions and Zipf's Law', Contemporary Physics, 2005, 46, 5, 323-51. 80. M. Mitzenmacher, `A Brief History of Generative Models for Power Law and Lognormal Distributions', Internet Mathematics, 2003, 1, 2, 226-51. 81. V. Pareto,. Cours d'Economie Politique, Vol. II (`The Law of Income Distribution') , in The Economics of Vilfredo Pareto, trans. R. Cirillo (Frank Cass and Co., 1979), pp. 80-7. 82. G. K. Zipf, `The Economy of Geography', Human Behavior and the Principle of Least Effort (Hafner, 1949), pp. 347-415. 83. G. E. Stephan, `A Research Note on Deriving the Square-Cube Law of Formal Organizations from the Theory of Time-Minimization', Social Forces, 1983, 61, 3, 847-54. 84. P. Bak, C. Tang, and K. Wiesenfeld, `Self-Organized Criticality', Physical Review A, 1988, 38, 1, 364-74. 85. M. H. R. Stanley, L. A. N. Amaral, S. V. Buldyrev, S. Havlin, H. Leschhorn, P. Maass, M. A. Salinger, and H. Eugene Stanley, `Scaling Behaviour in the Growth of Companies', Nature, 1996, 379, 29, 804-6. 86. P. Ormerod and C. Mounfield, `Power Law Distribution of the Duration and Magnitude of Recessions in Capitalist Economies Breakdown of Scaling', Physica A, 2001, 293, 573-82. 87. B. Podobnik, D. Fu, T. Jagric, I. Grosse, and H. Eugene Stanley, `Fractionally Integrated Process for Transition Economies', Physica A, 2006, 362, 465-70. 88. L. M. A. Bettencourt, J. Lobo, and G. B. West, `Why are Large Cities Faster? Universal Scaling and Self-similarity in Urban Organization and Dynamics', European Physical Journal B, 2008, 63, 285-93. 89. O. S. Klass, O. Biham, M. Levy, O. Malcai, and S. Solomon, `The Forbes 400 and the Pareto Wealth Distribution', Economics Letters, 2006, 90, 290-5. 90. F. O. Redelico, A. N. Proto, and M. Ausloos, `Power Law for the Duration of Recession and Prosperity in Latin American Countries', Physica A, 2008, 387, 6330-6. 91. L. A. Adamic and B. A. Huberman. `The Nature of Markets in the World Wide Web', Quarterly Journal of Electronic Commerce, 2000, 1, 1, 5-12. 92. A.-L. Barabasi and E. Bonabeau, `Scale-Free Networks', Scientific American, 2003, 288, 60-9. 93. S. Battiston and M. Catanzaro, `Statistical Properties of Corporate Board and Director Networks', European Physical Journal B, 2004, 38, 345-52. 94. D.- M. Song, Z.-Q. Song, and W.-X. Zhou, `Statistical Properties of World Investments Networks', Physica A, 2009, 388, 2450-60. 95. P. F. Delaney, L. M. Reder, J. J. Staszewski, and F. E. Ritter, `The Strategy-Specific Nature of Improvement: The Power Law Applies by Strategy Within Task', Psychological Science, 1998, 9, 1-7. 96. Y. Lee, L. A. N. Amaral, D. Canning, M. Meyer, and H. E. Stanley, `Universal Features in the Growth Dynamics of Complex Organizations', Physical Review Letters, 1998, 81, 3275-8. 97. R. L. Axtell, `Zipf Distribution of U.S. Firm Sizes', Science, 2001, 293, 1818-20. 98. A. De Vany, `Quality Evaluations and the Breakdown of Statistical Herding in the Dynamics of Box-Office Revenue', Hollywood Economics (Routledge, 2003), pp. 48-63. 99. Y. Fujiwara, `Zipf Law in Firms Bankruptcy', Physica A, 2004, 337, 219-30. 100. A. Ishikawa, `Pareto Index Induced from the Scale of Companies', Physica A, 2006, 363, 367-76. 101. R. Alexander Bentley, M. E. Madsen, and P. Ormerod, `Physical Space and Long-Tail Markets', Physica A, 2009, 388, 691-6. 102. E. F. Legara, C. Monterola, D. E. Juanico, M. Litong-Palima, and C. Saloma, `Earning Potential in Multilevel Marketing Enterprises', Physica A, 2008, 387, 4889-95. 103. M. Zanini, `Using "Power Curves" to Assess Industry Dynamics', The McKinsey Quarterly, November 2008. 104. P. Glaser, `Inequality in an Increasing Returns World' (working paper, September 2010). 105. J. Zhang, Q. Chen, and Y. Wang, `Zipf Distribution in Top Chinese Firms and an Economic Explanation', Physica A, 2009, 388, 2020-4. 106. M. Buchanan, `Power Laws and the New Science of Complexity Management', Strategy & Business, 2004, 34, 2-10. 107. M. Gladwell, `Million-Dollar Murray: Why Problems Like Homelessness May be Easier to Solve than Manage', The New Yorker, 13 February 2006. 108. J. Hagel, `The Power of Power Laws' (Edge Perspectives with John Hagel, 2007).